That’s right. These are the seeds of those trees which seemingly were wiped out during the first half of the 20th century by a blight brought to the US when Chinese Chestnut trees were imported into this country for landscaping purposes. Not enough to wipe out what was at the time an amazingly valuable timber tree (such a fast growing tree that they could be cut down and the ‘sprouts’ harvested 5-10 years later for railroad ties), in the Appalachian Mountains, they were basically used as a source of ‘mast’ (the term used to describe tree seeds of all types that remained on the ground in the fall) to fatten hogs by subsistence farmers. They also used to gather the nuts by the wagonload and send them to large cities in the fall (those ‘chestnuts roasting on an open fire’ were American chestnuts), so this was a crop which literally kept subsistence farmers in places such as West Virginia alive. Once the trees were killed off, those farmers ended up moving to the cities. But that was a digression. The DH and I went to a meeting of the regional forestry owners association to see a presentation on what is happening now to the American Chestnut. 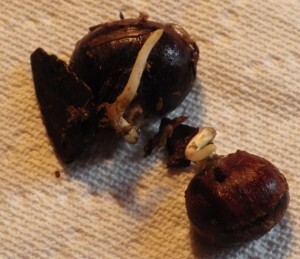 Various groups in this country, not content to just put up with eating Chinese chestnuts (larger but not ours…) and wanting to re-establish the American Chestnut (seemingly a fool’s errand since the blight is still out there) have been making almost Herculean efforts to find chestnut trees which somehow have survived to produce pollen and nuts. Now most of these trees get to a certain size, get the blight and die, but in the meantime, they do their job with pollen which can be collected and sent to organizations such as Syracuse University’s Environmental Science and Forestry College, which is working to breed an American Chestnut which will be resistant to the blight. To that end, the speaker gave away sprouted nuts to anyone and everyone there to plant into pots and then plant out in yards and property to create enough critical mass of trees coming into pollen and flowers that once the college comes up with a blight resistant tree, there will be other trees out there with which it can exchange pollen, create seeds (that is, nuts) and perhaps one day the east coast of the US might see some American Chestnuts in the woods again. Another nut which is undergoing a tremendous amount of interest and breeding work is the American Hazelnut. Now for those lovers of Nutella(tm), which is produced by the Italian company, Ferrara, hazelnuts are a very tasty item when combined with chocolate. They are actually very good all by themselves The nuts that Ferrara uses (and which they insist on using, much to the frustration of the hazelnut growers in Oregon), are European hazelnuts, which grow on a tree. They are large and lovely and Ferrara gets theirs from Turkey. The growers in Oregon mostly sell theirs to China. American native Hazelnuts are an entirely different breed of cat – they are a bush. Now, the bush can grow as tall as 10 feet and six feet around, but it is not a tree. The nuts in the wild are generally smaller. But the bush also is resistant to another blight (they are everywhere, people – everywhere), the Eastern Filbert Blight. European trees, such as are found in Oregon, are NOT resistant to this blight and the blight is making it’s inexorable march across the country. To that end, horticulturalists in Minnesota and at Rutgers in New Jersey are working to hybridize American hazelnuts to produce, depending on your outlook, a more tree-like bush, or a more bush-like tree. I won’t go into details here (you can go to the site for Badgersett Research and Rutgers University and search on hazelnuts to get more details of their work), but for us here at Chez Siberia, this is exciting stuff because a bush that produces nuts (that is, protein and fats of various sorts) in less than 10 years is a terrific thing to have. Nut trees take years and years to get big enough to produce nuts. 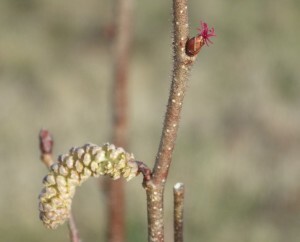 The item hanging down on the left hand side of the stem is a ‘catkin’ – these are the male flowers and when it becomes fully elongated and the flowers open up, the wind will carry pollen to what you see on the right hand side of the stem – that little bushy sort of red structure – the female flowers. Now hazels need catkins from separate bushes – that is to say, a bush that is not related – in order for the pollen to fertilize the flowers on it’s own bush. And the other bushes we have are not of an age to be producing catkins, so we will have a whole bush of very lonely and unloved flowers this year, but perhaps next year. Posted in: w88 wolves sponsorshipRaising It. All your links to past articles appear to be broken. I’m getting 404 error on every one, except going through your posts one by one (although I do enjoy that as I’ve missed for a while). Just wanted to give you a heads up. Always find great value here.